Human rights groups have protested against the execution on Friday of a young Iranian woman for a murder committed when she was 17 years old. 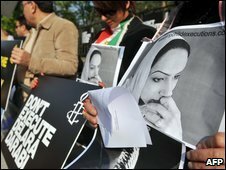 Amnesty International said it was outraged by Delara Darabi's hanging and that she did not get a fair trial. The head of Iran's judiciary had recently granted a two-month stay of execution but her lawyer says this was disregarded by the prison authorities. Ever since her confession Ms Darabi, an artist, had said she was innocent. She said she had taken the blame to save her boyfriend. 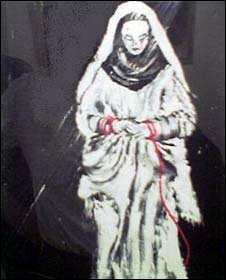 Her case received international attention after dramatic paintings and drawings created in her cell were seen around the world. The head of the Iranian judiciary recently granted a two-month stay of execution. But according to her lawyer this order was simply disregarded by the prison authorities, who provided no notice of the execution. The BBC's Jon Leyne in Tehran says that early on Friday morning Delara Darabi made a desperate phone call to her parents, saying she could see the hangman's noose. "Mother they are going to execute me, please save me," she said, before a prison official took the phone away and said: "We are going to execute your daughter and there's nothing you can do about it." Hassiba Hadj Sahraoui, Amnesty's deputy chief for the Middle East and North Africa, said that the execution was a cynical move to avoid international protests. "Amnesty International is outraged at the execution of Delara Darabi, and particularly at the news that her lawyer was not informed," she said. "Amnesty International does not consider her trial to have been fair, as the courts later refused to consider new evidence which the lawyer said would have proved she could not have committed the murder," a statement by the group said. The statement added that Iran had executed 42 juvenile offenders since 1990, in disregard of international law.